On 16 August 2001 I travelled from Waterloo to Masterton in the cab of 1606 passenger train. I returned on 645 express freight. This page provides some detail on that evening's operations. and also provides additional information on the Wairarapa Line. I have recorded my impressions of the journey on the main Masterton Cab Pass page. 1603 Masterton - Wellington passenger (with camerman) passes 1602, the 0758 Wellington - Masterton train, opposite the Wellington locomotive depot (on the left) just after 0800. The photo was NOT taken during my cab journey to Masterton - the weather was too bad for photography. (Photograph 8/8/01). The Featherston - Masterton section is operated under Track Warrant Control. The Track Warrant for 1606 was issued before the 1611 departure from Wellington as the preceeding train (1607, the 1459 Masterton - Wellington passenger) had reported clear of limits at Featherston at 1533. 645's warrant was obtained just before departure from Masterton. 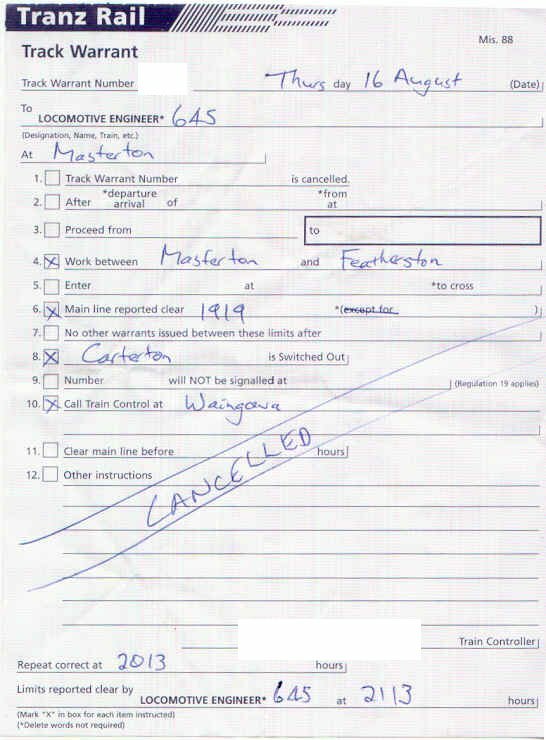 It authorised "work between Masterton and Featherston" because we were shunting at Waingawa. Six bogies from Masterton, mostly logs, but some woodchips. Picked up another seven bogies at Waingawa, which built the load to just over 500 tonnes. Note that the load for a single Dc up to the tunnel from Featherston has been reduced from 750 to 500 tonnes. 645 did not shunt the sawmill at Upper Hutt. A woodchip wagon was on the siding but it was not full. I had not realised that the grade out of Upper Hutt weas so steep. As we passed the sawmill we could look down on it and the partially full wagon. 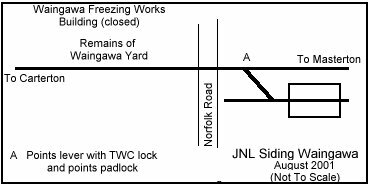 The wagons from Masterton were left on the main line while 645 entered the JNL siding at Waingawa to pick up wagons. The Norfolk Road crossing alarms were on all of the time we were shunting. There is a switch to turn off the alarms but it did not seem to work. Two cars were flagged across and another car had a long wait when 645 straddled the crossing for a while. This occurred after we had pulled out of the siding and backed onto the rest of the train and the brake tests were being done. There was a further slight delay while it was conformed that the shunter had the Warrant key. 645 had a "Work between" warrant although the rear of the train did not set back so I am not sure if it was necessary. 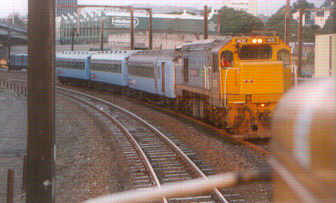 Mondays to Thursdays fourteen trains a day are scheduled to run over the Featherston - Masterton section ( August 2001). The departure and arrival times below are from the respective terminal stations, not the times in the section. I have estimated the times at Masterton for 670 and 671 by assuming a running time of two hours between Wellington and Masterton. This graph shows that two crossings are scheduled each day at Featherston. There could be at least two more if freight trains are running late.